I have done a few updates in our dining area for the third time now, and decided that I finally like how it looks. This is our only eating area in our house: we have breakfast, lunch and dinner here, we do homework, crafts and host dinner parties. 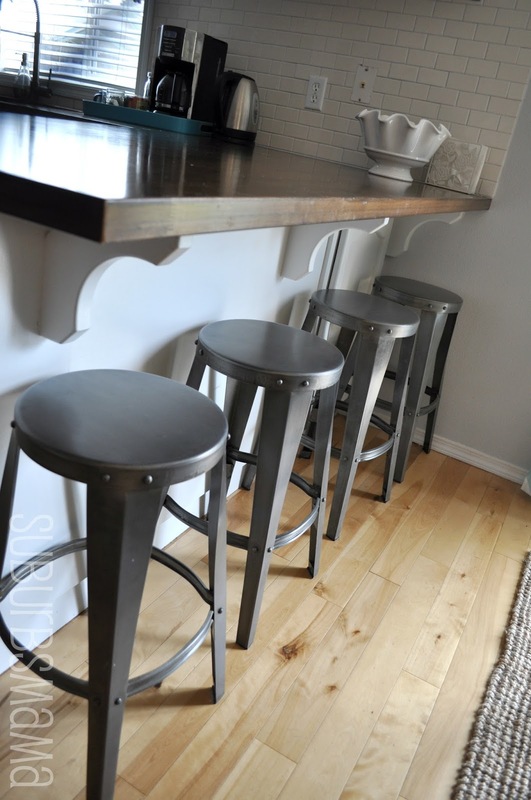 Paint color: Sterling by "behr"
It looks amazing! You did such a great job, and I LOVE your curtains! Oh...so pretty! I love the chevron curtains! It gorgeous! I love the addition of that little side buffet. Those are always such a great way to store extra kitchen supplies. I love the pic of your kid in the high chair too...haha, we love that Ikea chair! That looks amazing! I LOVE the sideboard. Like, a lot. And the little birdies are right up my alley. Four thumbs up. Looks great! This space looks great! 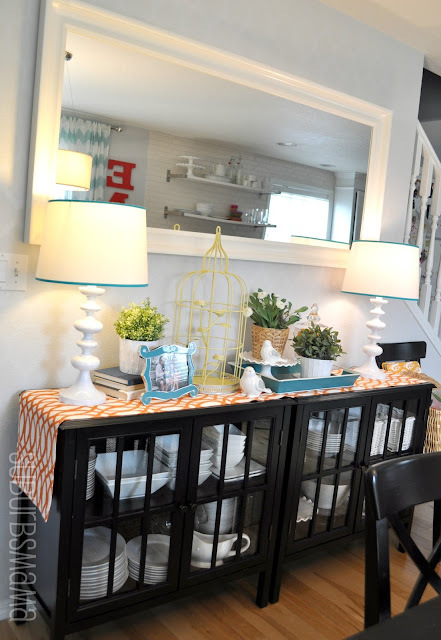 I love the tray on the table and those lamps are amazing! Great, great job! 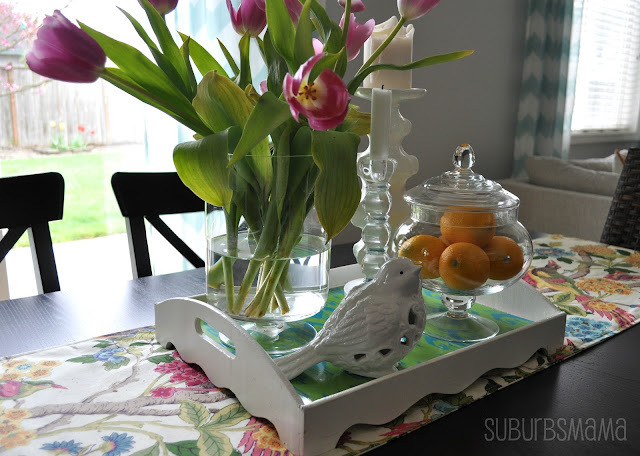 every time I come back to your blog I fall more in love with your style and home! it seriously looks like something out of a magazine! love it!! I love seeing the transformation of your space. Your home really is so beautiful. Thanks so much for visiting my blog. I am a new follower! It looks amazing!! I love the transformation. Gorgeous! I LOVE those curtains!! Now your dining room is as FAB as your living room... I really need a springy revamp on mine! Your dining room is gorgeous! I moved in to a new construction home in 2010, and I still have the standard builder-grade "chandelier" in my dining room. 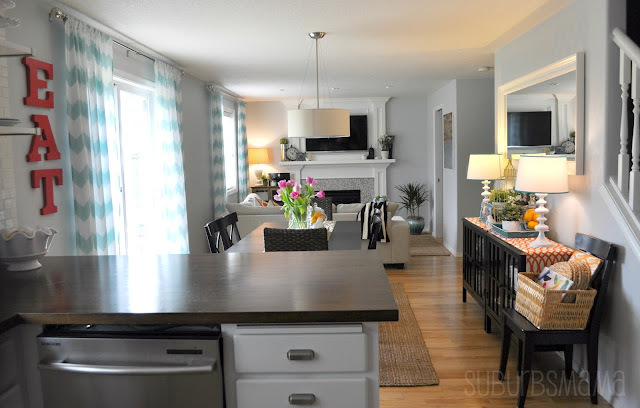 The dining room is the next room I plan to remodel, and I can't wait to rip down the ugly light fixture I have and replace it with a clean and contemporary fixture like yours. Your kitchen is beautiful! Isn't it fun to see how we progress in our he decorating. So pretty! Rita, you have a real knack for putting together a beautiful room! Wanna come over and help my kitchen, it's definitely a "before"! I love the open shelving you used and the new light fixture over the table. You have added a lot of nice touches and details that really pull a room together. Your arrangements on the table and sideboard are lovely! I can tell a lot of time and thought went into making the perfect kitchen for your family to enjoy. Looks incredible! Love the soothing color scheme and the pop of orange with the table runner. great job! It looks great. I love the way it came together. Its so pretty!!! Love the pops of color and the layout works great! Thank you for sharing with us at the Give Me The Goods Link Party! Hi! I love it! Great style! How is your Ike's jute rug?? I've been contemplating it... Also, love the two cabinets as a sideboard - gonna have to "steal" that idea. Thanks for sharing! Wow, you did a great job-I love every single detail. Well done! Cute! Love the teal and orange. I'm visiting from Just Us Four. Your room looks fresh and modern and fun! So nice to meet you Rita. I am your newest follower. Stop by for a visit sometime. Beautiful! Love the sideboard (s?) and the pop of orange. I'm visiting you today from DIY Showoff. I hope you get a chance to stop by my blog and leave a comment, too! I love the striped throw. I have the same one. It's amazing how that little bit of pattern can make such a big difference. I like the new curtains too! It looks beautiful Rita! You have great taste! Thanks for sharing it at Monday Funday! New to your page... Not even sure how I found you but soooooo glad that I did. I just copied your link and sent it to my husband with the title "dream inspiration". We have a similar flow from our family to dining to kitchen and I've been trying to convince him of how to mix certain colors, add a fireplace, paint the dining table black, etc. and to trust me that it would look good. This post finally helped turn the corner! Thanks so much! Love your space! I love your dining "area" ! And guess what ? we are Ikea-dining-table-"buddies" ! I also really like your buffet and the white lamps. Take care ! 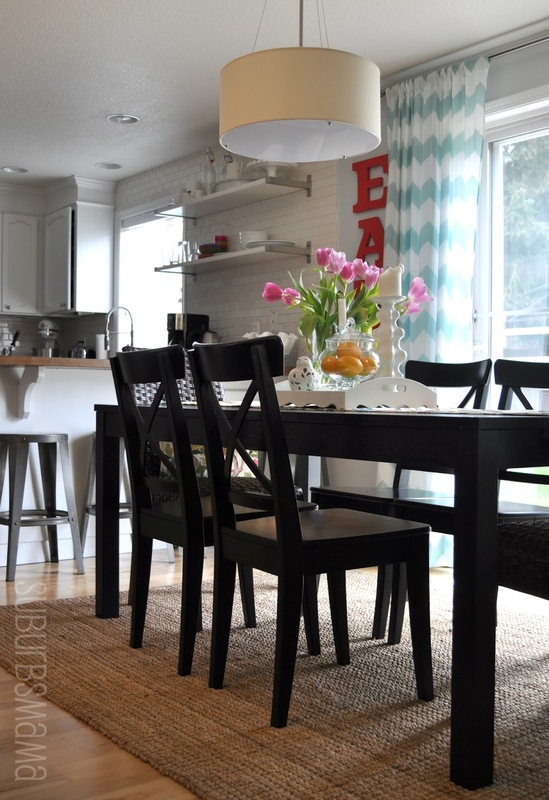 Your dining area is gorgeous!! I love all the changes you made! I'd love if you had a second to check out my first ever room makeover. It's gorgeous! I love the accent colors you used, and your curtains are dreamy! Your house has style! All of the improvements have come together to make a fresh appealing space. 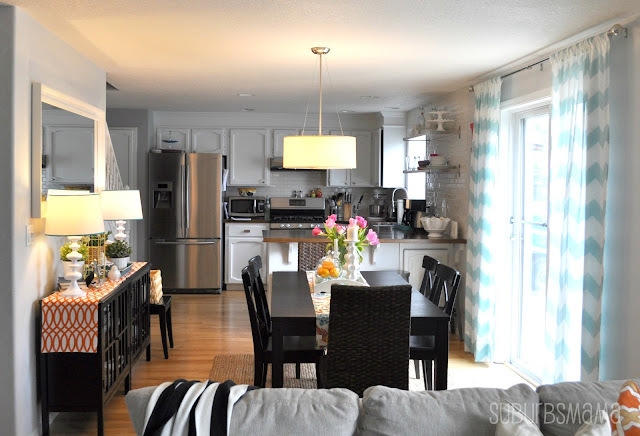 Love the open shelving, tiles, cabinet bonnets, white paint on cabinets, metal stools, fabric color and prints. Just everything. Great job. Looks great! Love the orange EAT against the pale blue. So pretty! So, so pretty! I have a black table, and have been toying with painting it white, but your black table looks so great in your picture that I just might keep mine (a lot less work!). Thanks for sharing! Enjoy your day! This looks beautiful! And so approachable (i.e. comfortable!). Thanks for showing the "in the middle" photos too - I love seeing the progression. I've never seen something from you I didn't like. This is WONDERFUL! What a great room! Love your style. Nice to meet you and visit with you today. Visiting from Pieced Pastimes and SO glad I found your blog! Such a beautiful room!! 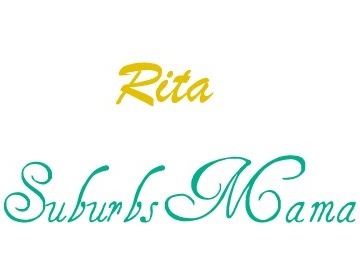 Rita, you were featured at Give Me the Goods Party this week! Come on by and grab your "I Brought the Goods" button! Thanks again for partying with us and sharing your wonderful room and we hope you party with us again this week! I love it with your kitchen. So cute. 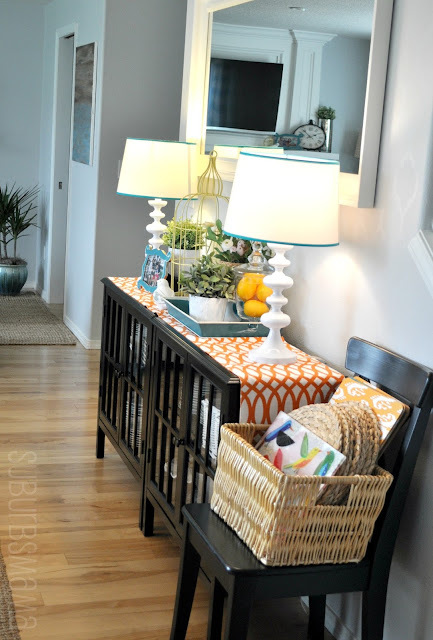 Love, love the lamps and all the white dishes in your cute credenza. Such a stunning makeover! The current design looks pieced together over time and so welcoming. The perfect combo for a room that your family enjoys so much! Congrats on such a beautiful makeover! That is a really great remodel. I love that you changed the bench into chairs and I only say that because, for me at least, benches make it hard (for me) to sit up straight with good posture comfortably. 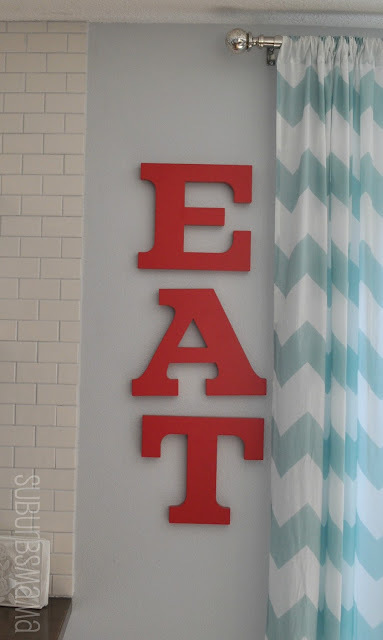 lol I know, I know, silly... but when I want to eat, I also want to think about eating and not about sitting. I love your house!!!! I am moving in 2 months and I will need to paint my new house. I love the light gray of your family room!!! Could you tell me what is the color? Thank you!!! I love every detail simply wow!! I love that its not crowded and its not too naked at the same time its as Michelle said "Perfect!! love the room!! i'm have been debating on a jute rug for our dining room FOREVER!! but w/ 5 kiddos . . . i'm wondering if i'm crazy! how easy is it to clean?? we use our dining table for everything too . . . so i would love to hear how your rug is holding up! The kids had spilled on this jug, had gotten play dough framed into it, yet it still cleans really well. Atleast this one from IKEA does, it has a thick jute knit. My friend had a jute rug from World Market, and said her kids spilled milk on it and it left a raised bump on the rug when it dried. Not this one. If one side gets too dirty, just flip it over, you have two sides to work with :). Plus I am not too worried about it, we had this rug for about 3 years now and it still looks good, but if something terrible happened to it, I could just go and get a new one since it is less then $100. 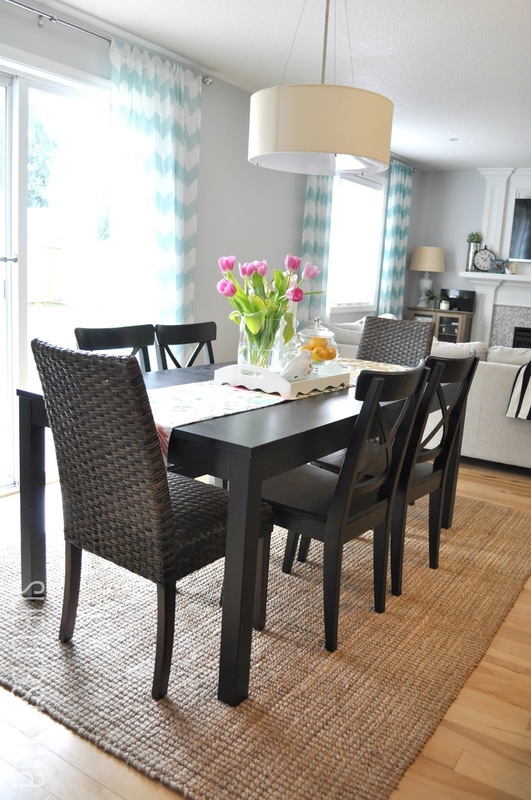 Most rugs are so expensive and I know a wool or different fabric rug would never last here in our dining room. Cute room!! Where did you get your table?? I love it. Love your room! What are the dimensions? (If you don't mind sharing?) I would like to try something similar in our room but we're concerned about lack of space. Your set up looks very airy-- just curious to know if the length and width of the room is similar to ours (from the back of your sofa to your kitchen counter). Also, what are your measurements of the table? Thanks in advance!